The Imperial Ultracarb ceramic filter cartridge has the same benefits as the regular Ultracarb, however, the roughly 1/3 larger diameter allows a significantly greater flow rate. At the present time, the Imperial Ultracarb is available only as a cartridge. 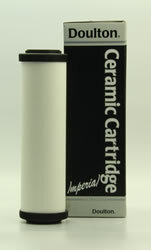 The Imperial Ultracarb cartridge is 2 3/4" O.D. by 9 3/4 long and is designed to fit most industry standard 10" water filter housing accepting double-open-end caps (DOE) cartridges. Recommended change frequency ..... 12 months or 1000/4000 gallons/litres, whichever is sooner. Total capacity for reducing chlorine is somewhat less than the Supercarb.